Quibids Strategy - Tips To Win at QuiBids.com! Quibids is unique in the penny auction world as they are one of the largest penny auction sites in business and because 100% of their auctions have a buy one now feature. They have tons of auctions up for bid every day and a wide assortment of items up from grabs. From the very inexpensive and easy to win items, like the Quibids.com t-shirt to the high end flat screen HDTV’s and MacBooks. There is a huge assortment of items up for auction every day and this page will provide some specific quibids strategies that will help you win your fair share of Quibids penny auctions. Winning at Quibids is not easy. Check out these winning tips for quibids and improve your chances of winning a great deal! Set a Bid Budget – and stick to it. If you are not willing to go to “BIN” on an auction then set aside a certain percentage of the retail value of the item (may we suggest, 30%) of bids and bid and use those trying to win. Bid aggressively – if you are going to spend your bids, spend them aggressively! Either single bid with a quick bids strategy or just use bidomatic instead of last second bidding. Always do this unless you are specifically playing defense. Aggressive bidding means bidding on top and being the count down bidder to beat. Spend the bids aggressively, I like to call this quick bids at quibids. Put yourself in the place where other bidders have to stop you from winning instead of you having to stop them from winning. Follow the general penny bidding strategies that are the foundation to a winning long term penny auction strategy that wins. Avoid ‘tilt’ – tilting means letting your ego and emotions get involved to the point where you spend more money in bids than you can afford. This happens a lot at qbids.com because the site is so large and there are so many bidders fighting over the items. Consider it entertainment – do not ever spend more in bids than you can afford and remember that there is no guarantee that you will win any auction. Understand how voucher bids work – essentially they work the same as a normal purchased bid except they do not have any value towards the ‘buy one now’ program. It is good to know if your competition is on paid bids or voucher bids if you are figuring out how close to the buy it now price they are at in the auction. Understand that you may not see every auction that is going on the quibid home page. – This caused a shitstorm in the penny auction world when this was first uncovered and it was referred to as ‘trap pages’. Essentially what is happening according to the theory of the bidders who uncovered it, is that as you are profiled at Quibids you are shown certain auctions with groups of other auction members and some of the other auctions were not available to you. We feel that all auctions should be open to all bidders, however things like this are in the T’s and C’s (they were added later cough cough) but I really dislike this at quibids.com, almost enough to make me decide not to purchase any additional bids there. Since every qbids.com auction offers a buy one now feature it leads to the auctions functioning a bit different than what you will experience on the sites that do not have a BIN option. The most common difference is that it is very common for bidders to jump into auctions late in the game. These bidders are known as jumpers and it is what I would consider the norm here at QuiBids. Some of the smaller sites will have ‘unwritten rules’ that bidders adhere to about not jumping one another but on QuiBid this does not seem to be the case since each bidder can simply ‘go to bin’ if they so choose and not totally lose the money invested in bids already. Single bidding is a bit more prevalent as an aggressive bidding strategy. This is because the way their count down timer works that if you are using the bid-o-matic to bid then your bids will randomly fire, sometimes not until your competition has counted down all the way to 1 or even ‘GOING’. This means that other bidders may mistakenly think that this auction is about to close because they do not see you bidding at the 1 second mark even though you have our auto bidder on. Single bidding aggressively with an auto bidder backup is fairly common here so that means you need to evaluate the single bidders more carefully than you do on other sites where the aggressive bidders are auto-bidding and the passive bidders are single bidding. You can fairly closely learn who is active in an auction whenever the quibids timer hits 1 and kind of pauses for a bit. At this point, all the bidders who are last second bidding will usually all place a bid and the site will register multiple bids virtually all at once. If you are aggressively single bidding, being the count down guy, be sure you give it around 2 seconds after the last bidder places their bid to reclaim your top count down position or you could waste a bid with the late bidders jumping in with last second bids. Each time you get the count down to go down to 1 and the slew of single bidders have to stop you, you are giving yourself a shot at winning. Perhaps all of the bidders decide at the same time to save a few bids and let the others bid a few times at 1 second. It has happened before and this is the situation you are looking to get into. It is often more advantageous to be up against two or three bidders than just 1 stubborn competitor as it is less ego driven when there are other defenders trying to stop you than just one other bidder who can’t let it go. Work to bid in spots like this and being the aggressor, giving yourself chances to win. 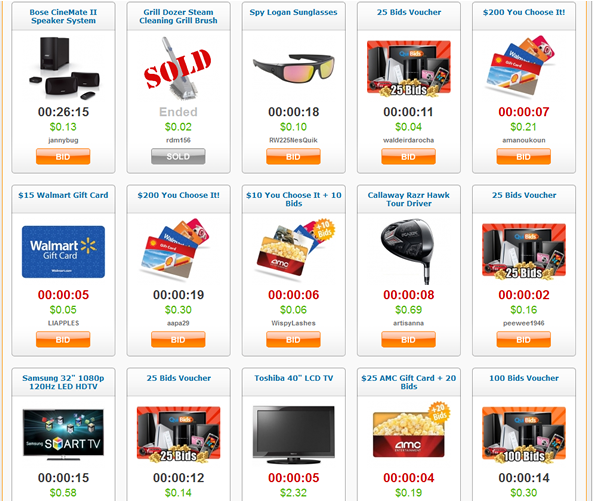 I like to bid at quibids.com for specific products I have decided to purchase outright more so than a site that I go to to score a great deal or win an amazing product for pennies on the dollar. Look at Quibids.com to be more of a shopping destination than a competitive battleground for incredible deals (check out beezid.com for that). To me it seems more like at Quibids you get a low risk shot to buy an item at really good discounts for the risk of paying retail cost + for an item. QuiBids attempts to limit some auctions to participants of comparable skill, as determined by QuiBids, to enhance user experience and maintain a viable business model. In so doing, QuiBids may limit which auctions are available to particular users based on any factors deemed appropriate by QuiBids in its sole discretion, including experience of the user, historical success of the user, demographic factors, prior bidding and spending activity, and other factors. In particular, QuiBids may limit certain auctions to less experienced or successful users in any manner QuiBids deems appropriate to optimize the overall user experience of all QuiBids users. You acknowledge that You may be, and You consent to being, excluded from auctions at QuiBids discretion. Essentially you can have some auctions excluded from you depending on factors that are not disclosed by Qbids. I do not know about you but this is a pretty important strategical consideration in my book. The more you win, the tougher it gets. Essentially it sounds like it is bidder pool management sorted in whatever factors they deem appropriate. It is disclosed in the T’s and C’s. The combined facts of how quibids works (being a BIN site, segregating the bidders, how the auto bidder works) all lead me to choose to shop for specific products at quibids.com but not where I am “playing” the game of penny auctions. I like to buy bids and turn a profit by winning more in real value than I spent on bids. Not going to be a long term strategy for me at Quibids. I like to play the game and trying to win deals outplaying my competition. To me, this makes me want to shop for specific products here that meet my requirements in that I want this item. I am willing to pay retail prices if I must and I can not find it for a considerable amount less shopping online. Beezid Strategies – competitive battlefield where you can win incredible deals. Skore it Master Class – high level game play at SkoreIt!